Since I love cooking and taught home economics in high school for twenty years, I’ve always been fascinated by old kitchens and the appliances cooks used back in the 17th and 18th centuries. 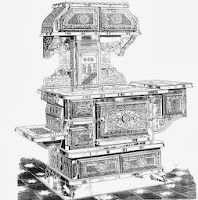 Since we all do some form of cooking whether by microwave or conventional stoves, I thought it would be interesting to look back at some of the antiques and to learn more about cooking in history. The first cook stoves go back a lot further in history than I remembered from my days as a student of such history. The first cast iron stoves began in about 1728 and were of German design. In 1740 Franklin improved the design and created what he called the “Pennsylvania Fireplace.” It was based on the original six-plate stove. By 1760, ten plates of cast iron were used. Four plates formed an oven and added two hinged doors. Smoke passed through the openings on either side and out a pipe. 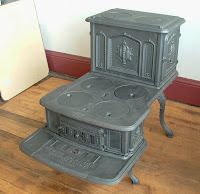 By the 1820’s and through 1870, the most common stove was the “step” stove. The one pictured was used in that time frame. The circles on top were heated by the fire under them. You can see the “step” in front of the stove. 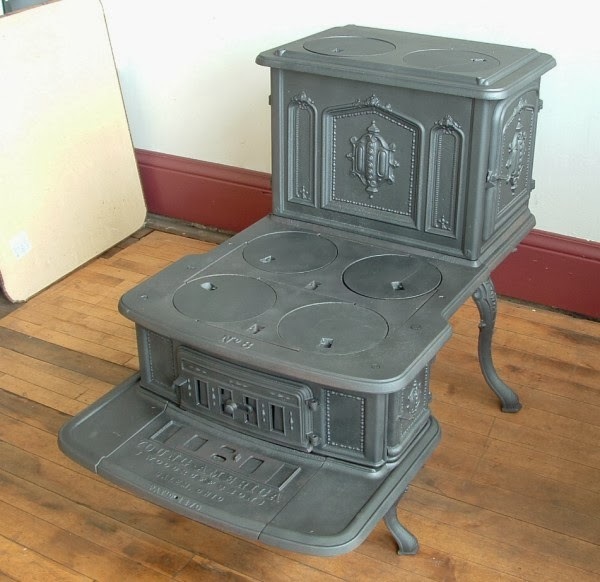 By 1890, a much more elaborate stove made its appearance, and by the turn of the century the stoves became much more convenient and added time to the cook’s busy schedule. Manufacturers began a search for new heat sources other than wood or coal. Gas became an alternative. However, gas was considered too expensive a fuel to be burned for cooking (not to mention the source of an after-taste in some minds). After 1900 electric power companies nibbled away at their major source of income, lighting, they turned to the kitchen and the cook stove for new market. Gas ranges had no need for the heavy, cast iron box of a wood- or coal-burning range, they could be built in much lighter and more compact forms. 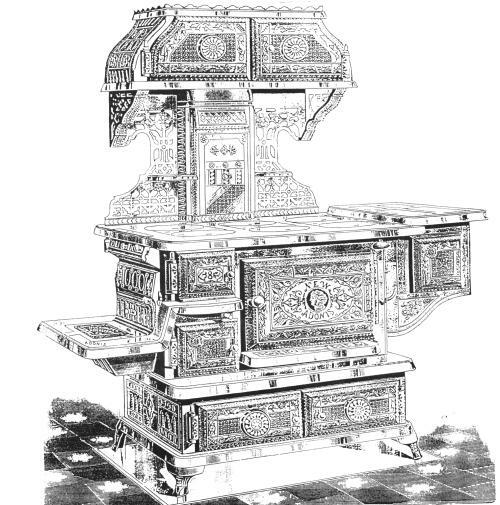 These new stoves were light enough to stand on slender legs to become, along with sinks, one of several pieces of freestanding furniture in the early modern kitchen. 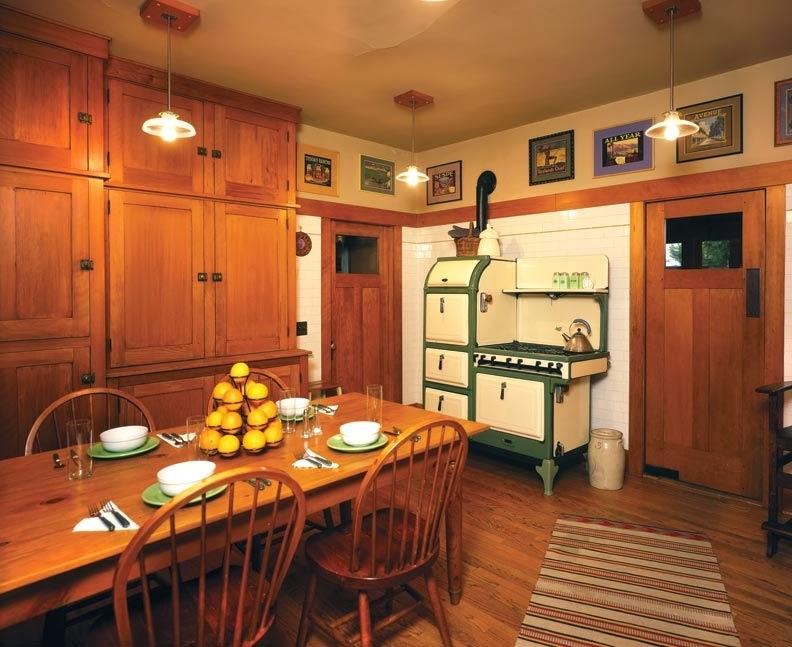 One of the iconic images of the 1920s kitchen is the special gas cabinet range with its distinctive barrel-door warming oven on top. They also were more colorful than the old black iron ranges. 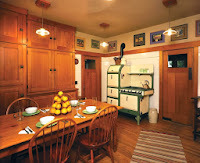 The one above is an antique stove from that era in a more modern kitchen setting. By the Roaring Twenties, the cabinet range hit its stride as a five-burner, two-oven appliance with reliable heat regulators or thermostats to control oven temperatures. Today, cooks enjoy either gas or electric ranges along with microwaves for instant cooking. I don't cook as much as I once did with three growing boys, but I still much prefer my modern kitchen with a gas range top with a microwave above it and electric built-in ovens. How about you? What do you prefer for cooking? Thanks to the Antique Stoves website for the pictures of the older stoves. Interesting information here about the history of cook stoves. 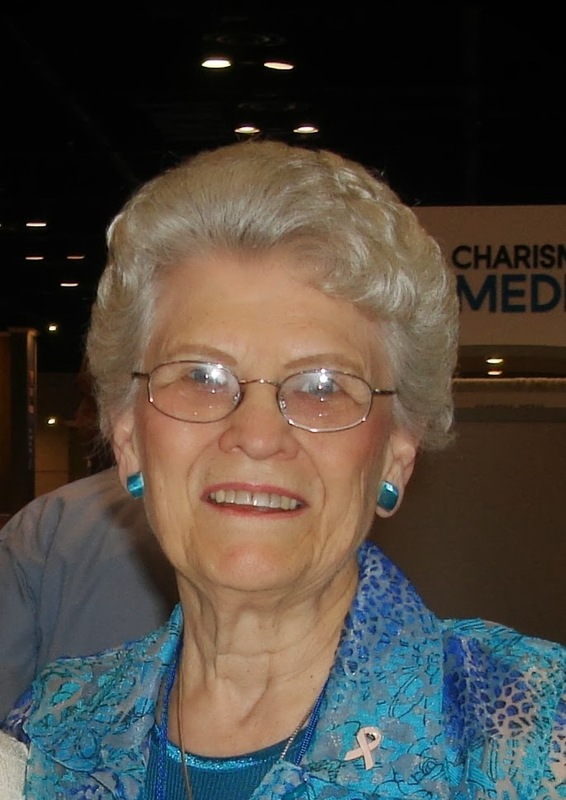 Martha Rogers is a free-lance writer and was named Writer of the Year at the Texas Christian Writers Conference in 2009 and writes a weekly devotional for ACFW. Martha and her husband Rex live in Houston where they enjoy spending time with their grandchildren and attending football, baseball, and basketball games when one of the grandchildren is playing or performing. She is a member of several writing groups. A former Home Economics teacher, Martha loves to cook and experimenting with recipes and loves scrapbooking when she has time. She has written two series as well as several other novels and novellas. The first book in her new series, Love Stays True, releases in May, 2013. I love those old stoves. Someday I want an old farmhouse and put one of those in it to use. The only thing that scares me is how easy it was to start fires in the house with those. Great post! Great post, Martha! I love the old stoves of yesterday and in fact, when my husband had a "cook shack" built at our ranch, he had a replica of one of the "oldies" brought in. It is totally modern, yet looks like one of the classics of days gone by. I love old things but I must say that I am thrilled that we don't have to use wood or coal any more for our everyday cooking. Thanks for this great post! It is amazing how far stoves have come! I do some cooking now, but I don't think I would have cooked at all back then. I doubt I would have gotten the hang of it! I love the different cook stove pictures, though I don't know how many people had the 1700s models. In my 1794 novel, I have my characters cooking in a hearth or directly over the fire. My aunt and uncle have a house in new England built in the late 1700s, and their kitchen fireplace has an iron arm over the top and a hearth to the side. That's what I've always envisioned people using. But our neighbors down the road have a wood cook stove just like the one you've got at the front of the post. They use it all winter long and then use their regular wood stove as a secondary heat source and overnight. They cook coffee and soup on it all the time. Laurie, for some great pictures of stoves from the 1700's on, check out the website I mentioned as a source of my information. Great web site. Most people prefer gas stoves - I have always preferred electric, it just seems safer, & easier, to me. Thanks for the interesting post, Martha!